Unified Metropolitan Transport Authority, UMTA, an authority to integrate the roles and responsibilities of various entities involved in transport planning was the subject matter of discussion in the Workshop on UMTA hosted by Corporation of Kochi on November 26,2012. The Workshop was intended to explore the need for UMTA in Kochi which was formally inaugurated by the Kerala State Ministry for Fisheries and Excise, K. Babu. 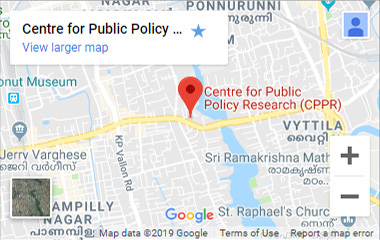 CPPR had earlier proposed the need for creating a UMTA for Kochi for proper planning and co-ordination of Transport in Kochi which has road, water and air systems in place. See https://www.cppr.in/unified-metropolitan-authority-umta-in-kochi/. Mr Elangovan, NATPAC presented on UMTA and the mechanism to execute it from the context of Kochi and Kerala.Mayor and Deputy Mayor of Cochin Corporation, Member of Kerala Legislative Assembly, Councillor and representatives from various Chamber of Commerces, NGO’s etc participated in the Workshop. It was decided to have further discussions on the manner in which UMTA has to operate in Kochi and Kerala.